'Writing is a way to mould oneself into a creative frame of mind'. Writing skills are an important part of communication. Good writing skills allow us to communicate our message with clarity and ease. Witty International School, Udaipur organised a Composition and Report Writing Competition for the students of Grade VI to VIII on December 3rd, 2018. 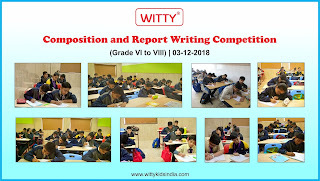 The competition helped the students enhance their vocabulary, expression, coherence and grammatical range and accuracy. The students enthusiastically participated in the competition and showcased their creative writing skills.